Selsey’s new ASDA has risen from the ground, with residents beginning to see what the store will look like. 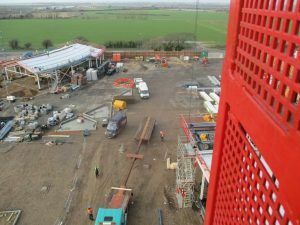 Building work is on target with the steel frames of the supermarket and adjacent restaurant erected, and roofing and cladding well advanced. A good section of the car park has been built. Highways improvement works will start in mid-February and are expected to last around three months. The 15,000 square foot store at Park Farm on the Chichester Road will bring jobs to the area and provide the town with much-needed new food shopping. The construction team have already established excellent relations with local people, with one resident even delivering a plate of fruit scones to the builders. “We have never seen this before, the cakes were delivered to the Selsey site team by a resident in Manor Road. What hospitality!” said Craig Goodison of the main contractor, the RG Group, which has been running retail projects for 25 years. Most of the underground infrastructure work is complete and work is beginning on the roads and footpaths. This will involve forming a new entrance to the car park, alterations to the roundabout outside the sites on Chichester Road and Manor Road, road widening and highways improvement works. This element of the project will take around 11 weeks from mid-February. 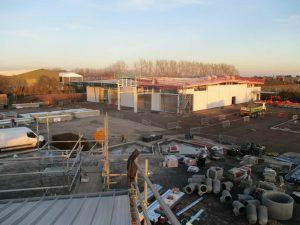 The new ASDA and restaurant and a four-pump petrol station are all on course to open in the early Summer. The £3.7 million project is being masterminded by local property developer Landlink Estates, part of the West Sussex-based Langmead Group. Landlink appointed RG Group to run the site because the construction management company has more than 25 years’ experience specialising in retail projects.